STATEN ISLAND, N.Y. -- To honor California fallen police officer Ronil Singh, the non-profit organization Blue Lives Matter-NYC is hosting a fundraiser in February. Singh, 33, came to the United States from his native Fiji to fulfill his dream of becoming a police officer and worked in the Newman, Calif. police department, according to the Associated Press. The day after Christmas, he stopped an immigrant who came into the U.S. illegally, who then shot and killed the corporal, according to authorities. Singh is survived by his wife, Anamika, and their 5-month-old son. Imperatrice said he was hurt by the news of Singh’s death because it reminded him of his own nine-month-old son. The fundraiser will be held on Feb. 6 from 7 to 11 p.m. at La Caverna in Manhattan, located at 122 Rivington St. Tickets are available online or at the door for $50 each. All ticket sales and proceeds raised at the event will go to Singh’s wife and son. Imperatrice said he’s expecting the fundraiser to attract 200 guests. He hopes to present the check to Singh’s wife and son, or a family member, at the February fundraiser or at Blue Lives Matter-NYC’s annual gala in April. The non-profit organization was created to help law enforcement officers and their families during their time in need. Members of the organization are both police officers and members from other states and federal agencies dedicated to making a difference. -Associated Press material was used in this report. STATEN ISLAND, N.Y. -- There were no outs and a runner on second base. During the last inning of a scoreless game against the Sanitation Department, MTA bus operator Charlie Amorelli was walking to the batter's box. The transit union-sanitation department game was one of four first round matchups in Blue Lives Matter's first Battle of the Badges -- a charity organization that aims to bridge the gap between communities and those who protect and serve it. The softball showdown at Staten Island's Richmond County Ballpark aimed to secure bragging rights in New York City while raising money for Blue Lives Matter. "If you could ever hit the ball to right field in your life, now would be the perfect time," fellow bus operator and Amalgamated Transit Union 726's head coach Joe Ciancio shouted as Amorelli stepped to the plate. Amorelli lifted a single to centerfield, spurring the rally. Sanitation's hard-throwing side armor, Fred Grimaldi, then walked the next batter, loading the bases. But he recovered by securing two easy pop outs. ATU 726's next hitter, bus operator, Mike Cannavo, worked a full count. With a discerning eye, Cannavo watched ball four passed low at his shins. He pumped his right fist as he jogged to first with a walk-off -- MTA bus drivers topple the Sanitation Department, 1-0. "Sanitation's pitcher pitched unbelievably, but unfortunately someone's got to win and lose," said transit union coach Joe Ciancio, "And thank god we came out in front. "We have guys playing from all walks of life. It's just an excellent way to get everybody together with the community," said organizer Joe Imperatrice, an NYPD sergeant who is the president and founder of Blue Lives Matter. "Cops take notice. Things like this reassure them that they have the support of the public." Eight teams competed in the day-long, two-game elimination competition: Blue Lives Matter's own team of NYPD officers from around the city; the Fire Department; DSNY; Staten Island's local ATU 726, which represents MTA bus operators; Richmond County Ambulance Services; a team of NYPD detectives and another representing Richmond University Medical Center staff. A police force from Manalapan, N.J. also competed. "If we win again, free bus rides all day for Staten Islanders," one ATU 726 player declared, jokingly, as he walked off the field from his team's round-one victory. After the deaths of officers Rafael Ramos and Wenjian Liu, Imperatrice began Blue Lives Matter with a straightforward rubber wristband campaign to rally support around his fellow officers. His organization raised more than $100,000 selling wristbands, alone, and hopes to continue building on that momentum with community-based events like the city-wide softball tournament, he said. "Hopefully we can make this an annual event," Imperatrice said. The teams were honored to take part in the event. "Blue Lives Matter is a great cause," Richmond County Ambulance Services (RCA) catcher Jason Geller said. "We're just glad to be here. Win or lose, the charity is all that matters." But the taste of defeat was still bitter. "We made all plays," said Sanitation's pitcher Fred Grimaldi after the loss to the MTA bus operators. "The team we played works right down the block from us," said RCA EMT Michael Grova. His team took a loss to Richmond University Medical Center in the first round. "So we really wanted to win." A member of Blue Lives Matter hugs Officer Brian Moore’s mother Irene at the 105th Precinct’s Community Council Meeting Wednesday. Over the past few weeks, the 105th Precinct has been transformed to a shrine of sorts, dedicated to Detective Brian Moore, the 25-year-old who was shot and killed in Queens Village earlier this month. Whether it’s letters written by a Catholic school in West Islip or banners painted by the nearby IS 109, every memento added another layer of love atop the tragedy of losing an officer. There was an air of melancholy when Moore’s family walked into the stationhouse on Wednesday night. The loved ones had their photographs all over newspapers and television, but seeing them in person; it was hard not to get a lump in your throat. Moore’s father, Raymond sat stone-faced, staring ahead as the monthly announcements were read. Brian’s mother, Irene, sat quietly across the room. The parents’ composure weakened only once, during an emotional presentation given by Blue Lives Matter. The group, based in Staten Island, was created to help law enforcement officers and their families during their time of need. In addition to Moore, Blue Lives Matter also worked with the families of officers Rafael Ramos and Wenjian Liu of Brooklyn’s 84th Precinct. The officers were shot and killed while sitting in their patrol car in December. “In addition, we invited the Ramos and Liu family to throw out the first pitch during the Brooklyn Cyclones game on August 9 and we invite the Moore family to participate as well,” Imperatrice said. The group also presented the family with T-shirts and elastic bracelets in honor of Brian Moore. As Imperatrice and his colleagues enveloped Brian’s mother into a hug, she momentarily broke down and sobbed into Imperatrice’s shoulder. The room offered a round of supportive applause in honor of the family who endured so much. After the presentation, the Moore family was escorted out of the room. The commanding officer said officers from around the country also sent gifts, including a handcrafted wooden plaque from an officer in Las Vegas. “The support ahs just been overwhelming, again, thank you,” Coyle said. There will be bats, balls, fans, food and maybe even a bouncy castle, but it won't be the Staten Island Yankees playing at Richmond County Bank Ballpark on July 11. Instead, the non-profit organization, Blue Lives Matter-NYC, will be taking over the house of the Baby Bombers for a truly unique sporting showdown featuring the city's very own civil servants. Police officers, firefighters, sanitation workers and many other public-sector workers will duke it out in a round-robin softball tournament for a shot to be crowned New York City's best. While all important bragging rights are on the line, the event is much more than a battle for softball supremacy; all proceeds collected in conjunction with the Battle of the Badges will go directly to Blue Lives Matter-NYC, an organization committed to bridging the gap between the community and those who protect and serve it. "We want to show that police activity in the community goes beyond our civil duties," said Blue Lives Matter founder Joseph Imperatrice. "Police officers and the community they serve should be working together, and this is a great start." Great doesn't even begin to accurately surmise the organization's meteoric rise. What started as selling wristbands to benefit the families of fallen officers, Blue Lives Matter-NYC has grown into a brand recognizable not just in New York any longer. "We raised over one-hundred thousand dollars during our wristband campaign," said Imperatrice. "Hopefully now we've grown beyond that and can help make positive changes in our community in other ways." The Battle of the Badges is just the tip of the iceberg for the non-profit with other events planned for the ensuing months and hopes of expansion in the future. The Staten Island Yankees will once again team with the organization on Sunday Aug. 11 to sponsor a day devoted to Blue Lives Matter and its charitable contributions. In attendance for the Baby Bomber's bout against the Brooklyn Cyclones will be the families of fallen officers Rafael Ramos and Wenjian Liu, who will throw out the first pitch. "The crimes committed against officers Ramos and Liu were our original inspiration for the establishing of this foundation," said Imperatrice. "It's only fitting that we have their families come out so that they can be formally recognized." The Battle of the Badges and the Cyclones/Yankees game are just two of the events the organization has planned this summer, as "it seems like almost everyday" to Imperatrice that he is receiving phone calls from interested parties. "I've had people from other states reach out to me in hopes of starting chapters elsewhere in the country," said Imperatrice. "We want to help combat the negative reputation police officers may have and continue to give back to the community for many, many years to come." Blue Lives Matter is built on a platform of transparency, as the organization strives to keep the public informed on where every donated dollar goes. "If people look at our Facebook page they will be able to see all the ways in which we give back," said Imperatice. "Our goal is one-hundred percent transparency so that those who support us can know exactly where their help is going." While Blue Lives Matter-NYC may only be in its infancy, its impact is already undeniable. The civil servants who dedicate their time to this organization has helped it blossom into what it has become, but only the public can help take the organization to the next level. So come July 11, pack the whole family in the minivan and take them out for a beautiful day at the ballpark and support a good cause in the process. Long Island, NY) Assemblyman Dean Murray (R,C,I-East Patchogue) joined many of his Assembly Republican colleagues to stand in solidarity with our law enforcement officers today at a “Blue Lives Matter” press conference. Blue Lives Matter is a nonprofit organization founded to provide donations to the families of fallen police officers. 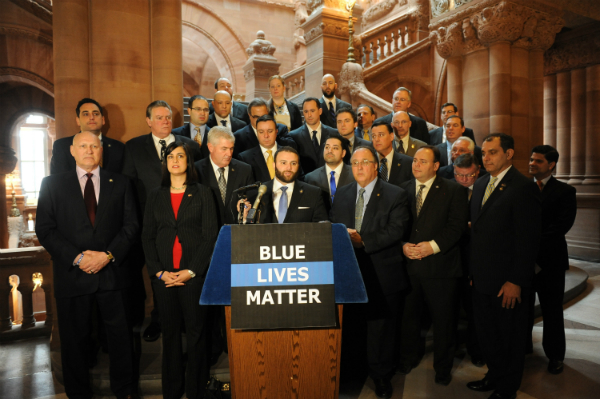 Assemblyman Murray and his colleagues at the Blue Lives Matter press conference. Photo Credit: NYS Assembly.